This 7mm-08 ammunition from Remington is designed to keep recoil to a manageable level so you can focus on making the best shot you can without worrying about a sharp kick in the shoulder. Each cartridge in this box of 20 fires a 140 grain version of Remington's proven Core-Lokt soft point bullet at a muzzle velocity of 2,361 feet per second. The Core-Lokt bullet, as its name suggests, is a mechanically locked design that prevents core-jacket separation when the bullet strikes a deer or other animal. An intact bullet delivers much better terminal ballistics than a broken one! Managed Recoil ammunition isn't simply a full-power round with a weaker powder charge. Instead, Remington engineers its bullets to produce maximum expansion at lower velocities, minimizing the compromise necessary to achieve reduced recoil. This ammunition is loaded in the USA and uses non-corrosive Boxer primers and brass cases. We don't have any reviews yet for this particular 7mm-08 Remington ammo from Remington. 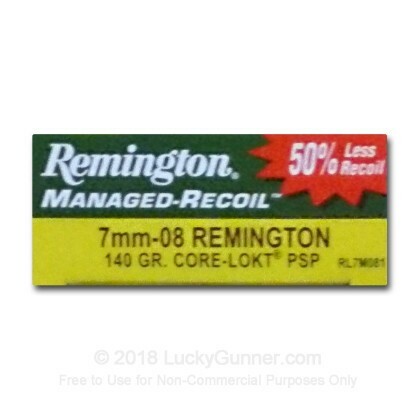 If you'd like to be the first to review this particular 7mm-08 Remington ammo from Remington, fill out the form below.